The Hyatt Regency Maui Resort & Spa on the island of Maui is located on the southern end of Ka'anapali beach, rated one of the best beaches and vacation spots in the United States. The resort offers spectacular ocean views, as well as views of Lanai and Molokai. It is approximately thirty minutes from Kahului airport, five minutes from Lahaina and is a perfect spot for a family vacation. The Ka'anapali resort area was one of Hawaii's first master planned resort developments and is centered between two golf courses and the ocean, with the Hyatt on the southern end and the Sheraton on the northern end at Black Rock. In between these two hotels, along the four mile stretch of beach, are a few hotels including the Marriott, Westin, a few condo rentals and Whaler's Village. Whaler's Village is an outdoor shopping mall, with shops, a free museum and restaurants. It is situated on the same stretch of beach as other resorts, including the Westin Maui Resort & Spa, which I previously reviewed here. Both resorts are top-notch and either one would be a great choice for your Maui vacation. If I had to pick one, I would choose the Hyatt for the dining options available onsite, the pool area and overall high level of service offered here. The resort is situated oceanfront on the southern end of where Kaanapali Beach starts. The resort area map is shown below. When first arriving, you have the option of either using the valet parking service or self-parking. Valet parking is $20 per night or you can self-park for $16 per night. The valet attendant will give you the option of being able to check-in first and then self-park if you go that route. At check-in you will be greeted with a lei, given a resort map and a rundown of all of the main features of the resort and what the daily resort fee covers. Note that if you are a Diamond member of the Hyatt Gold Passport loyalty program, you will save $10 on the resort fee. 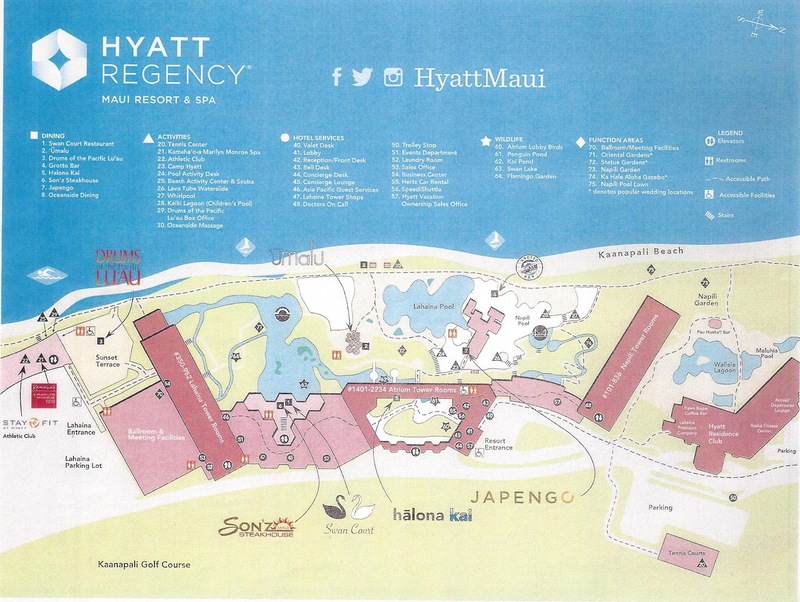 The main lobby area is an open air space and currently has a large sales desk area showcasing the newly opened Hyatt Kaanapali Beach Residence Club next door. The atrium is landscaped into the shape of the State of Hawaii and also has lots of nice art pieces and ponds with koi fish, penguins and exotic birds, which kids will love. There is a daily Koi Fish and Penguin feeding at 9:30 am. Overall, the resort grounds are very well maintained and the overall service we received from the resort staff was very good. There are two main pool areas, the Lahaina pool area and sun deck and the Napili pool area, with a swim in grotto/bar and waterfalls between the two pools. The Napili pool area has a splash area with fountains for kids and offers a slide and water activities opposite the main Lahaina pool area. Just past the central atrium and walking towards the Lahaina Tower of the resort, there are a few shops, including Macy's, Sunglasses Hut, a general store, Honolulu Coffee and an Expedia activities center. There is also another timeshare sales desk for the new resort next door and also the photo desk, where you can take advanatge of a complimentary photo session that includes a free 5x7 photo. There is also a spa, the Marilyn Monroe Spa and 24-hour gym on the far southern end of the resort grounds. The beach directly in front of the Hyatt is Narrow and rocky and not suitable for swimming. You can either head towards the southern end of the resort grounds, near where the spa and gym are located, to swim in the ocean or venture on to the opposite end of the resort, in front of the residence club, for a more swim friendly beach area. The beach at the Hyatt is ok, but doesn't compare to the beach area on the opposite end of Kaanapali beach near Black Rock, as there is more room there and a larger beach area available. There are great dining options located onsite, as well as other restaurant and food options along Kaanapali beach at other hotels and at Whaler's village, an approximate 10 minute walk from the Hyatt. Japengo: Voted the best sushi restaurant in Maui and it doesn't disappoint. It offers more of a fine dining experience, overlooking the beach and ocean. You can expect seafood, sushi and Pacific Rim food here. Umalu: Next to the Lahaina pool area and offers more casual dining options and poolside drinks. Son'z Steakhouse: Open for dinner and offers upscale dining featuring steaks and offers a full wine cellar. Ulalani's Hawaiian Shave Ice: New location at the Hyatt Regency Maui near the main pool area and Umalu. Perfect cold treat to enjoy poolside. Club Lounge (for club level rooms and Diamond members): Located on the top floor of the atrium tower and offers continental breakfast, snacks, drinks and appetizers throughout the day. There are lots of great activities and things to-do and see on Maui including: visiting Haleakala National Park, golf, surf lessons, road to Hana, parasailing, sunset dinner cruises, luaus, zip-lining, and fishing. 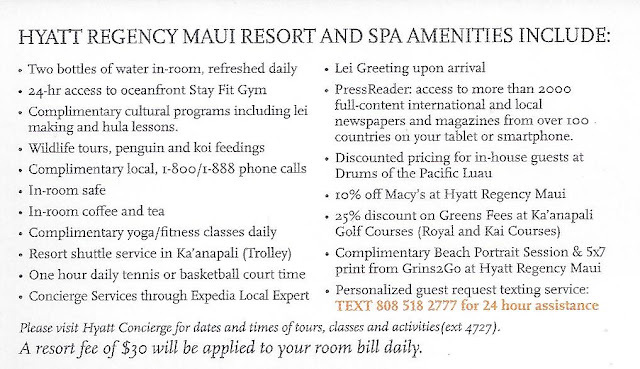 I plan on going into detail on some of these activities in a future post and instead want to focus on activities offered on site at the Hyatt Regency Maui and along Kaanapali Beach. The weather on our most recent visit here in September was very hot and humid. The warm weather is expected, but the humidity almost made it unbearable to be outside during the peak part of the day. Air conditioning or swimming in the pool or ocean was the only reprieve from the weather. Even the Maui locals and staff were saying this is not typical weather and it has been years since it has been this humid here in Maui. I suspect the tropical storms and the El Nino weather patterns forming in the Pacific Ocean are lessening the trade winds around Hawaii and causing the temperature and humidity to spike. For our most recent stay here, before checking in next door at the Hyatt Residence Club, I was able to use a Suite Upgrade I had as part of being a Diamond member in the Hyatt Gold Passport loyalty program. 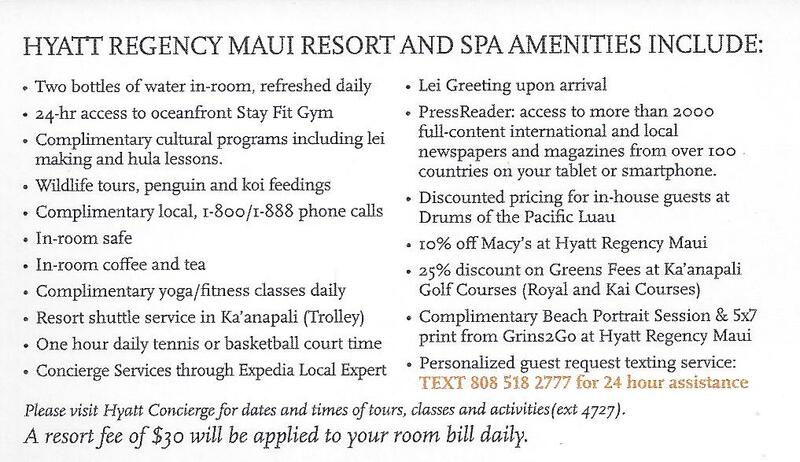 There are a few restrictions, but this benefit can provide huge value as you pay any eligible rate for a regular room and will be upgraded to a suite, which at the Hyatt Maui can be $850 per night and up. This particular suite, located in the Lahaina Tower, was nicely decorated, had very nice renovations in the bathroom and offered a great oceanfront view. Room rates year round can be high and it might make sense to try to book a package deal through the Hyatt website as they offer deals there sometimes like free nights or other package deals. Other good options may include checking for any Costco package deals that may include breakfast or resort credits. You could also consider booking through a travel agent as they sometimes can offer the same price as you can get online but offer extra value added perks such as free breakfast, activities or other credits. $50 discount per couple on a 60-minute Maui helicopter tour. $10 discount on full day cabana rentals. Complimentary tennis racket rental while playing at Hyatt Tennis Center.